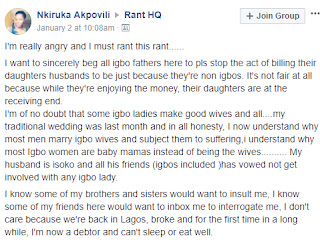 A young woman, Nkiruka from the Eastern part of Nigeria shared her experience to the extravagant bride price her town charged her husband during their traditional wedding. She mourned about how broke they are after the wedding and how their obligations is giving them restlessness night. She got married to non-Igbo man a month ago, December. The wedding made them debtors. This make her to comprehend why married Igbo ladies are subjected to various mal-treatments from their husband. She likewise included that she understand why most Igbo ladies are baby mamas instead of housewives. Nkiru asked Igbo Fathers to reduce the bride price and consider the young couple. Nkiru said Bride cost ought to be a Gratuity Tip not the high value they charge spouse to-be. She believed that men are charged high since men worked more than ladies. She proceeded that Igbo men has promised not to wed Igbo women including her better half’s friends. This is the reason there are single Igbo women in the town. I want to sincerely beg all igbo fathers here to pls stop the act of billing their daughters husbands to be just because they’re non igbos. It’s not fair at all because while they’re enjoying the money, their daughters are at the receiving end. I’m of no doubt that some igbo ladies make good wives and all….my traditional wedding was last month and in all honesty, I now understand why most men marry igbo wives and subject them to suffering,i understand why most Igbo women are baby mamas instead of being the wives………. My husband is isoko and all his friends (igbos included )has vowed not get involved with any igbo lady.